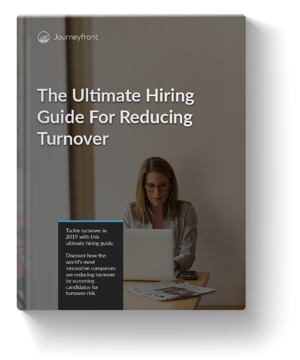 How Much of Your Hiring Process Should Focus On Turnover? 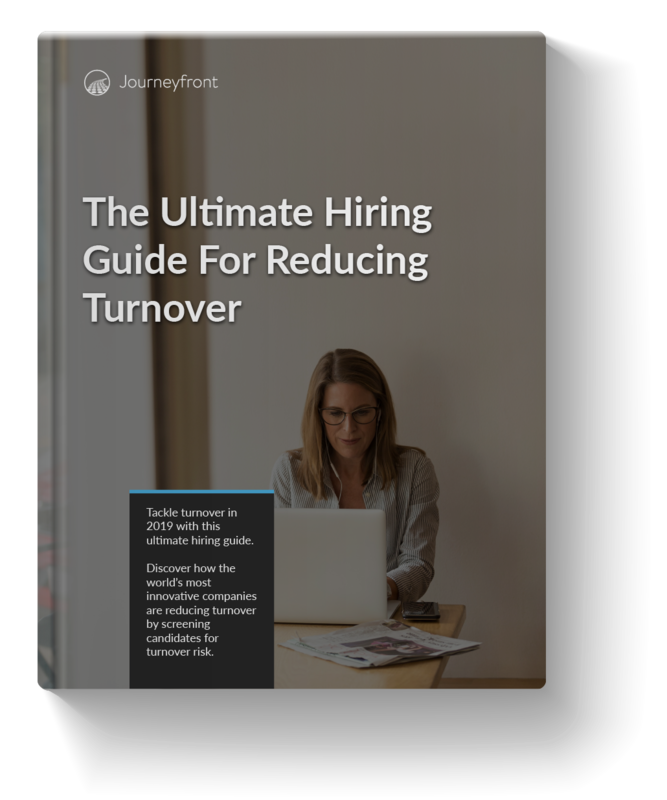 If 80% of turnover can be attributed to bad hiring decisions, it's apparent that incorporating retention-related criteria into your hiring process is the way to truly mitigate turnover. But it can be hard to determine how much of your hiring process should focus on turnover. Interested on how much turnover is costing your company? Click here to download our turnover calculator. Certainly, we are not advocating for 100%. There are many other important factors to evaluate in a candidate (performance-related, culture-related, and so on). 1. How high is your turnover? The higher the turnover (#1), the greater the percentage of your hiring process that should be allocated towards screening for turnover risk. 2. How difficult is the job? Likewise, the less challenging the job (#2), the more you can afford to replace steps in the screening process traditionally reserved for more performance-related criteria. This may seem obvious but it’s often not. As one anecdotal example, we recently began working with a retail client who’d been using sophisticated intelligence-based assessments to hire for a cashier position. In isolation, this wasn’t a bad thing. Every job requires some minimal threshold of intelligence and mental ability is one of the best known predictors of performance (generally speaking) that we have. However, an audit of this company’s screening process revealed that they were almost entirely focused on performance related criteria with almost nothing related to turnover. This might be fine for some positions, but for a cashier position with >100% annual turnover, it was a mistake. A good gauge for this is to ask yourself the following the question – assuming they were given the basic amounts of initial training required, what percentage of the population selected at random could do the job you’re hiring for? If the answer is 5% or 1%, most of your hiring process should screen for performance-related criteria. 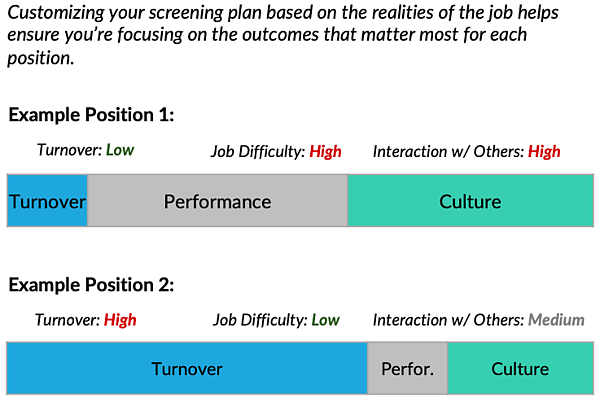 If the answer is 50% or 75%, you not only can afford to make turnover a larger focus in screening, you should. 3. How much interaction with others will the job require? The last question to ask is how much interaction with others will the job will require (#3). The less interaction that is required, the more you can afford to also substitute effort traditionally reserved for the cultural fit screen for a turnover (or performance) screen instead. A good rule of thumb here is the "jerk" test. How many people would be affected if I hired a jerk for this position. If the answer is a lot (as would be the case for example in a management or customer-facing position), then cultural fit should occupy a large portion of your screening process. If a jerk in the position wouldn’t impact that many people, then you can afford a bit more focus on turnover or performance. Screening for turnover is the step that companies most commonly overlook when it is clear it should be incorporated into every hiring decision. Enjoy this article? This is a small portion of our hiring guide "The Ultimate Hiring Guide for Reducing Turnover." Rhett has years of experience working with HR Professionals and Talent Acquisition Specialists from over 100 countries around the world. 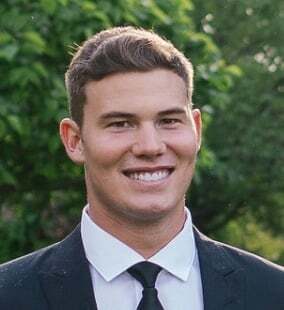 Working so closely with HR departments across a variety of industries, Rhett has a comprehensive understanding of HR best practices and effective methods to successfully reduce turnover and increase hiring optimization. With his assistance, HR departments from all over the world have been able to build a happier and healthier workforce. Tackle turnover in 2019 with this ultimate hiring guide. Discover how the world’s most innovative companies are reducing turnover by screening candidates for turnover risk.